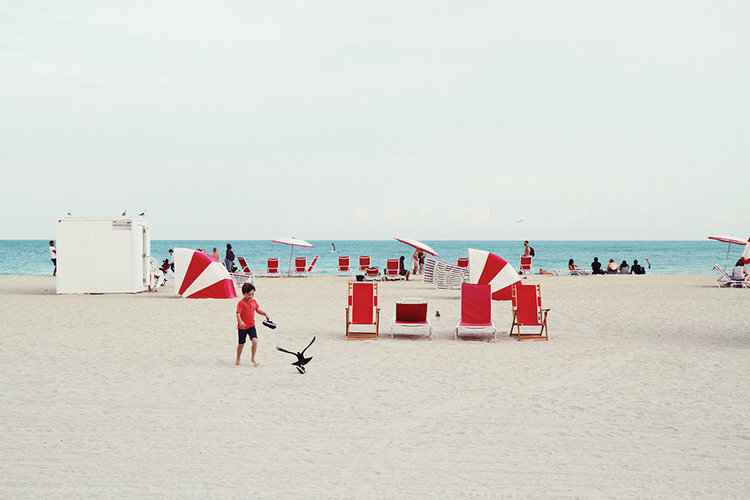 A little boy wearing a red shirt chasing down a bird. The red/white color scheme on the beach as well adds a nice touch. A red, white & blue painted auto-body shop located in Detroit. An odd apartment building in Philadelphia. One fourth of the facade was painted purple. An umbrella featuring the American Flag found in an abandoned building. The yellow line in the background also adds a nice touch. A nice mixing of colors and textures on the back of a building in North Philadelphia. A factory located in Brooklyn featuring bright yellow gates / text. A fairly quiet intersection in Tokyo. I loved the contrast & how the red on the building really stands out. The fact the light was red as also a nice touch.